Undefiable grinds out a victory in a lifetime best 1:52.2. MILTON, ON - August 7, 2018 - Bob McIntosh trainee Undefiable turned in a game performance to win Tuesday's second leg of the Whenuwishuponastar Series at Woodbine Mohawk Park. A group of eight rookie pacing fillies competed in the $14,000 second round of the three-week event. Round one winners Tall Drink Hanover and Key West were given the week off after impressive victories a week ago. Undefiable, who didn't compete in the first leg, was fired out to the lead by driver Bob McClure to post a :28.1 opener. Abuelita Hanover rushed from third to first in the second-quarter and led the rookies by the half in :56.3 and would carry the lead to three-quarters in 1:24.4. McClure pulled from the two-hole before reaching three-quarters to get a strong-looking Undefiable up alongside the leader and ahead of a rushing Deb. In the stretch, Undefiable grinded away to regain the lead and paced to the wire first to defeat a late-splitting Beach Bar by a neck in 1:52.2. Deb finished third, while Abuelita Hanover was fourth. Undefiable entered Tuesday's contest off a 1:55 maiden-breaking score on July 27. She now has two wins and two runner-up finishes in four starts for $21,000 in earnings. A daughter of Ponder, Undefiable is a homebred for Robert McIntosh Stables Inc, C S X Stables and Dave Boyle. She paid $15.60 to win. The $37,000 Whenuwishuponastar Series final will take place next Tuesday. 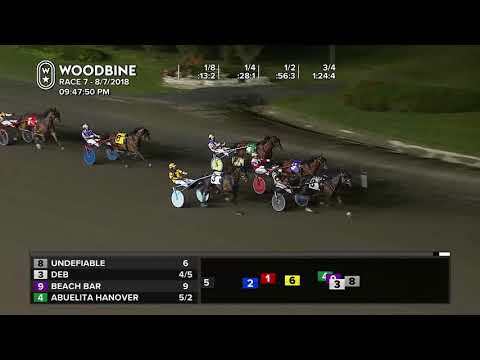 Live racing resumes Thursday evening at Woodbine Mohawk Park. Post time is 7:30 p.m.